I love this rose pattern - it is simply yet elegant. The roses are hand-drawn showing the rose from the top view. It is a fully open rose; each rose has two leaves beside it. 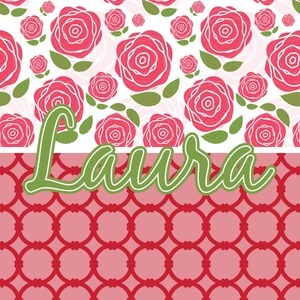 The pattern is made with different sizes of the rose and is a layered with very light roses in the background as well. For our two pattern layout design, we chose to pair the rose pattern with our connected circles tone on tone design. We chose to personalize with just a name in one of our popular fonts (Black Jack) and we put a double stroke on the name.